This Time Tomorrow: don't you agree? Socks and sandals are OK in my book. Unless they look like this. Agreed? Agreed. Love your dress and of course I love the socks and sandals! Socks and sandals...do that honey! I absolutely love socks with sandals when done chic....which of course, you always are!! Agreed. Worn this way they are totally cute! I love this look, very Edge Of Love. Is that the name of the movie? With Sienna Miller and Keira Knightly? anyway, I digress, love this look! Agreed! Everywhere I turn, it seems I see the sandals and socks combo:) Looks cute on you though! I love socks and heels. This may be one of those weird trends where people in 2030 are like, "Oh God, socks and heels are back?" But I don't even care, I love it. 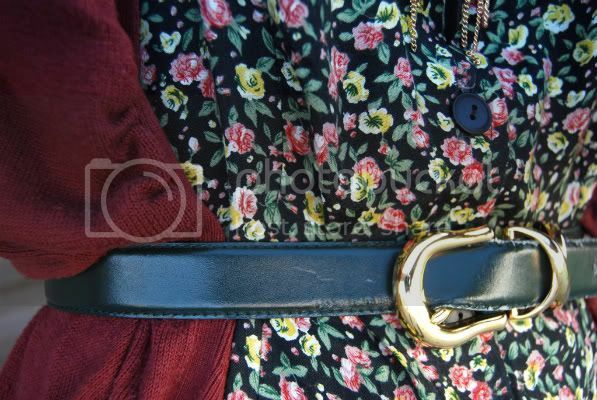 i love your belt and dress. I agree! love your dress! PS: Looooove the outfit. Like, seriously. LOOOOVE. I LOVE this outfit. I've been following your blog for awhile and this is my favorite so far. I love everything about it, especially the dress. Im digging this sock thing u got going on. i love that sock in sandals idea! and your dress' pattern is really cute! so cute, making socks and sandals chic! You might not think that's so important, but the setting actually MAKES this outfit a hit! You've got yourself a new reader babe! I'm totally in love with your outfit and of course with your style!! You have an amazing blog, love it! oh, wow! i've been absent from blogdom for a bit, but you are still one of the top posters in my book! :) and i STILL do want to do a feature on you on my blog...eventually!! I love socks and sandals! They're so cute when done well, and people are unnecessarily scared of it. I styled a shoot this past weekend, and when I handed the model a pair of socks to wear with the strappy brown leather wedges, she was like oh, are my feet not going to be in the shot? Some people don't get it. love the florals. so good. I love love love the maroon color of your cardigan! This is a beautiful look! You have a great style! Love the sandals with the socks!